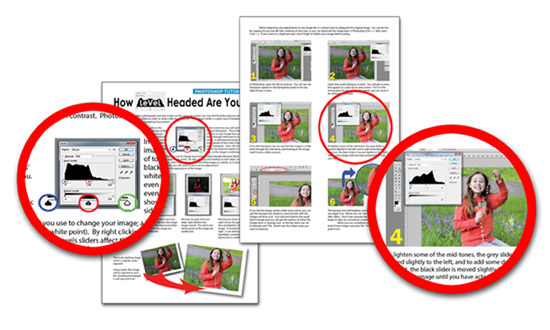 "Easily Learn How To Take Better Photos With Your Digital Compact Camera & Learn New Photography Skills By Subscribing To Our High Quality Easy-To-Understand Magazine"
Welcome to Digital Photography Tricks and our new magazine, Digital Compact Photography. My name is Mark McKnight and I've been interested in Photography ever since I was old enough to hold a camera. Over the years I've gained a vast amount of knowledge and experience in Digital Photography. As you'll soon find out every aspect of this magazine is professionally written and put together in an easy-to-understand layout. This is not some kind of home produced high school magazine or amateur type newsletter. That's because it's been designed using publishing industry standard software and layouts and nearly every picture, including the cover shot, was taken using a compact camera to show you just how easy it is to take great photos with a point and shoot camera. Most of the readers of Digital Photography Tricks use a compact digital camera, so I have too. This is a real world magazine for real world amateur and beginner photographers. As you will see as soon as you open it, the magazine flows smoothly from the front cover to the very last page, with a balanced range of tutorials, techniques and informative articles that are packed full of content. You've got to agree that the cover of this magazine, when you place it side by side with any off the shelf photography magazine looks every bit as professional, slick and eye catching. It looks fantastic because we extensively researched the article layouts and overall appearance to ensure the magazine was being presented in a professional, high impact way. Every aspect of this high quality magazine has been devoted to attention to detail and as soon as you read an article or one of the tutorials in the magazine you are going to be amazed at the quality and content. What Can You Expect On The Inside? Each tutorial starts off with a brief explanation of where to find the tool/technique and how it works, complete with screen shots for extra clarity making it really easy to follow and understand. There is also a demonstration of how the control or technique affects the image, before moving on to the actual step-by-step illustrated tutorial, which shows how to progress from the before picture to the final result. There are magnifications of small controls or detail enhancement so you can get the best possible overview of the lesson, together with brightly colored graphic details which highlight important segments. 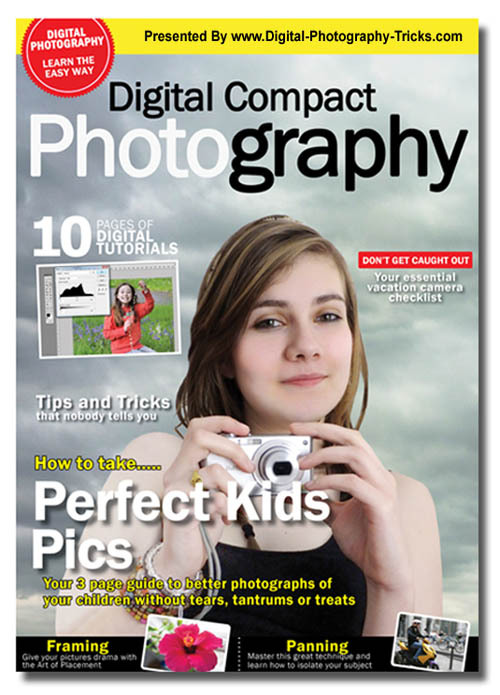 Each issue contains several main articles, a photoshop technique and photographic technique as well as compositional advice and an explanation of a compact camera control. What's In This Exciting First Issue? Page 2 - CHECKLIST: Make sure you have everything you need, in full working order, for your perfect vacation pictures. Page 9 - TIPS & TRICKS: Handy, useful tips from a professional photographer for things to add to your compact camera bag and ways to improve your photography. Are You Ready To Order Your Copy? This is a high quality, professional magazine for beginner/amateur photographers and is available on a monthly subscription basis. Every month you will receive a brand new issue as professional and informative as this one in a .PDF format straight to your email inbox. 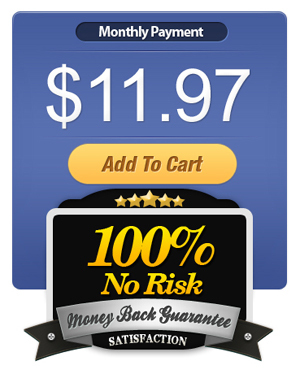 Get this stunning photography magazine every month for the low monthly price of just $11.97. You are not tied into any contracts and can cancel your subscription at any time. 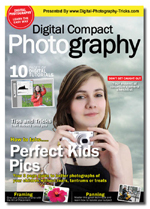 For a limited time only, I'm giving away the first issue of Digital Compact Magazine so you can see how high the quality and professionalism of this PDF photography magazine really is. Just enter your name and email address in the box below and the first issue will be delivered straight to your email inbox today. YES MARK! 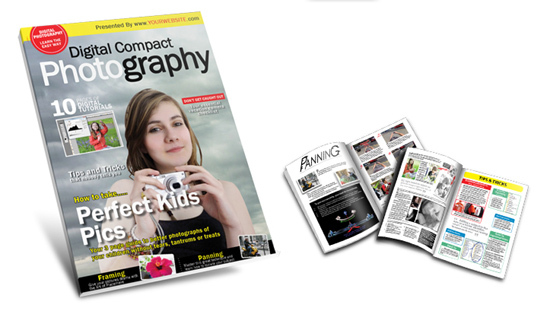 PLEASE SEND ME THE FIRST ISSUE OF DIGITAL COMPACT PHOTOGRAPHY MAGAZINE COMPLETELY FREE OF CHARGE!